A wonderful anthology of eight stories addressing children's rights and sustainable development, written by child authors from all around the world and produced in conjunction with UNESCO's Voices of Future Generations initiative. UNESCO's Voices of Future Generations initiative ... read full description below. 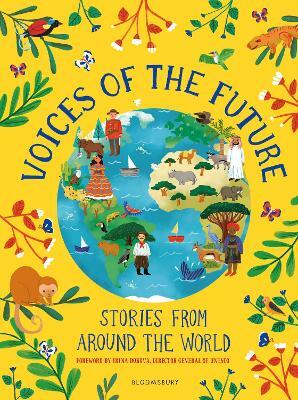 A wonderful anthology of eight stories addressing children's rights and sustainable development, written by child authors from all around the world and produced in conjunction with UNESCO's Voices of Future Generations initiative. UNESCO's Voices of Future Generations initiative works to empower children all around the world. The stories in this book are written by children aged between 8 and 12 from every corner of the globe: Canada, Mexico, Papua New Guinea, Samoa, South Africa, Taiwan, Uruguay and United Arab Emirates. With beautiful, full colour illustrations throughout by four talented illustrators, Jhonny Nunez, Giovana Medeiros, Marco Guadalupi and Mona Meslier Menaua, this book is the perfect way to engage children with the issues facing the planet and the lives of children in other countries. The children's stories are imaginative, empowering and inspiring. They focus on the UN Convention on the Rights of the Child and the Sustainable Development Goals and present likeable characters who go on problem-solving adventures to fix the problems faced in each region. ... and together, the children could build a better future. The Voices of Future Generations movement on children's rights and sustainable development is a unique programme of action that empowers children to promote the UN Convention on the Rights of the Child and the Post-2015 Sustainable Development Goals. The project works to assist children to advance the right to education and literacy globally through stories.